I often read that video game console manufacturers say that one of their goals in developing a new video game console is low power consumption. Aside from a lower electric bill, is there a technical reason why lower power consumption is desirable for a video game console? Thanks to anyone that replies. Re: Question about power consumption in video game consoles. Lower power = lower heat? Thank you for the information. I was pretty certain that was the main reason, but wasn't sure. Speaking of having to deal with excessive heat in video game consoles, unlike modern video game consoles, I don't remember many early cartridge based video game consoles having many noticeable vents for keeping them cool during regular use. Does anyone know what the first video game console was that really had noticeable vents, and possibly even cooling fans, for keeping them from overheating during regular use? Dreamcast. The early mockups looked very flat and sleek, then at launch it was suddenly a bit taller and stubbier. They had crammed in a heat-pipe and fan system with a noticeable opening on the side. That was right when console designs began to mimic basic PC builds and wattage started to climb. Early cartridge systems only used ~20 watts. PS4 launched with ~140W max and was considered a reasonably good achievement. Back to your original question, aside from wanting to avoid further RRoD debacles, I don't think power-efficiency is as much an ideal for console design as much as it reflects the general trend in chip design since 2006 or so. The Pentium 4 pushed power use to ridiculous highs and Intel refocused right around then. Likewise, the X360 came out power-hungry and prone to failure, followed by the PS3 which sucked even more watts. I don't remember exactly but I think both launch machines could use in the 300-watt range! Consider that in the previous gen more than 100 would have raised eyebrows and you see how ridiculous that is. These spikes all arriving in the same 2-year window gave the whole industry a new focus, so each new chip design since has focused on efficiency improvements alongside performance. This mindset has thankfully stayed consistent in the years since. Before the Dreamcast, the N64 had vents on the top and bottom, and little feet to keep the bottom elevated. No fan though. Thanks for the information, and that is very helpful. 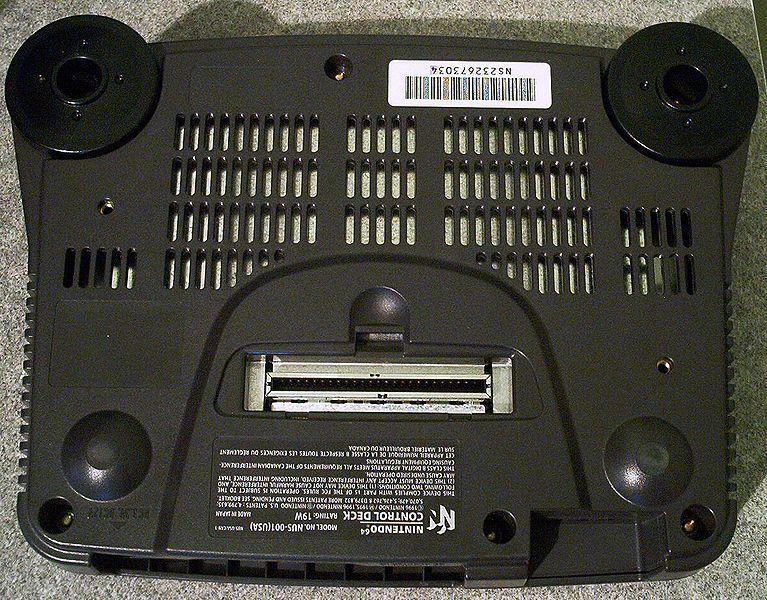 Also interesting that the cartridge based Nintendo 64 needed such large cooling vents. On a somewhat related topic, considering all modern video game consoles have the ability to load games to a hard drive, or other type of internal memory, does playing a game loaded onto a hard drive instead of a disc in the disc drive keep the system cooler during regular use, or does it not really make a difference? Loading from a harddrive is almost entirely about speed, especially seek times. As the amount of data games load at once increase due to higher resolutions, better quality textures, bigger levels, the loading time from an optical disc would be interminable. I also suspect optical drives are a bit more unreliable and prone to breaking down, since you're swapping out discs often and exposing both the discs and drive to dust and possibly grime, and mounted optical discs aren't going to be as balanced as a well built harddrive. No idea about the heat. One thought though is the the modern consoles store the OS on the HDD, so the HDD would be in use even if they used the optical drive for actually loading and running the game, instead of just validating the disc. Aesthetics are another factor. Those giant power bricks that modern consoles have are a pain in the arse to camouflage. The PS4 and PS4 PRo both have their power supplies built-in, no bricks. Also, the Xbox One S got rid of the brick and went with an internal power supply. Of course, since I have an XB1 Kinect, when I upgraded to the XB1S, I got rid of the XB1 brick, but then added a brick to separately power the Kinect, since the XB1S can't power the Kinect on its own due to the smaller, internal power supply it has. So I ran into an odd situation recently after hooking up my PS4 Pro. I have all of the consoles plugged into a battery backup surge protector. I have had zero problems so far before hooking up the new system. After unplugging the old PS4 and plugging in the new one, it beeps now like it's running on the battery back up system. So for the time being, I have it plugged into a different surge protector that is not battery backup. So I guess the new system is sucking that much more power than the old one that it's now tripping the battery back up? So I guess the new system is sucking that much more power than the old one that it's now tripping the battery back up? You should look at the manual, but the beeping may indicate the UPS is overloaded, not that it's on battery power. If you plug too much in a UPS, it'll be more power than the UPS can supply, and if it switches to battery, it won't be able to supply the amperage necessary to power everything plugged in. It's not a question of battery charge, but of how quickly it can extract that charge and deliver it. Take a look at what's plugged into the battery power on the UPS. I'd leave items with HDDs plugged in, but if, say, the TV or receiver is plugged into battery power, you could switch those to just surge protection. Thanks for the information, and that is very helpful. Less heat means it can run faster. Games produce little heat. If heat was a problem, then robust measures (ie better heatsink) would be used. Why do electronics find rooms well in excess of 100 degrees F problematic? That heat does not damage any semiconductor. Normal is for semiconductors to operate without damage at well above 200 degrees F.
Timing and thresholds change too much at higher temperatures (and are restored at lower temperatures). So a machine must be slower. Or speed is maintained by reducing heat created at those speeds. Then timings do not change too much. The warmer the air, the less efficient it is at sucking away heat from the CPU and GPU. My CPU is currently running at 70 C = 158 F. So the CPU is often much hotter than the surrounding air in the room. This is why when people overclock stuff they go with water cooling, because it's more efficient. Otherwise you'd need really powerful, loud, fans blowing a crap ton of air over the heatsinks. The warmer the air, the less efficient it is at sucking away heat from the CPU and GPU. True. And then we include numbers. The difference is irrelevant to the question. Pentium processor has operated at up to 350 degrees F. Obviously it does not work at full speed. But it works without damage. Running it cooler means it can execute faster. Intel recently risked the entire company on a process involving Hafnium. Had it not worked, Intel had no new products for years. But it worked. Hafnium meant Intel processors worked faster since it massively reduced power consumption and temperatures. AMD stock reflected their inability to address this heat problem. Some suggested AMD might be approaching bankruptcy. Their transistors leaked too much current, therefore ran hot, and operated with less performance. To keep making sales, AMD had to discount their 'hotter' products. Consuming less power means a processor can achieve better performance. Especially since Moore's law is so relevant. One more question. Considering that the upcoming Nintendo Switch apparently has built-in cooling vents, does anyone know if any other portable system had cooling vents? View Next Unread King's Quest (2015 - PC/XB1/PS4/360/PS3) - Classic Sierra Questing Returns!